WaterSHED is committed to a collaborative approach to effect systemic change in water, sanitation, and hygiene across Cambodia. To achieve this goal, we aim to work towards building an open and shared monitoring and evaluation platform. In 2013, WaterSHED collected sanitation coverage data in the districts where the organization currently operates. Background: Inadequate sanitation and hygiene behaviour is a major cause of infant and child mortality in developing countries. 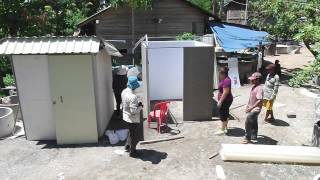 In Cambodia, less than half of the rural population has access to improved sanitation. To address this problem, WaterSHED uses a Hands-Off approach to build the market for toilets in Cambodia. The organization works closely with small businesses and local government and has facilitated the sale of more than 140,000 latrines. However, there is a significant lack of data on toilet coverage which makes effective targeting difficult and inhibits efficient marketing activities. WaterSHED began collecting data regarding sanitation facilities in all eight provinces in which WaterSHED operates. This report presents a detailed account of the methodology, data collection and processing, findings, and conclusions from the study. Surveys were conducted in partnership with Cambodia’s local government, which maintains ownership of the data represented in this study for planning and reporting purposes. Methods: WaterSHED operates in Cambodia in the eight provinces of Battambang, Kampong Cham, Kampong Chhnang, Kampong Speu, Pailin, Pursat, Takeo, and Tboung Khmum. The data collection for this survey has been conducted in 5,801 villages in 527 communes across 58 districts in these eight provinces. Conclusions: As of 2014, access to latrines in the districts surveyed is still low. On average 41.1% of all households own a latrine, with no province exceeding 52.9% in latrine coverage. The vast majority of these latrines are pour-flush latrines. Dry pit latrines only comprise 3.3% of all latrines. Disaggregating the data by district shows that particularly urban centers and market places show a significantly higher latrine coverage compared to the rest of the country. Also, this study showed that water filters are not commonly found in Cambodian homes and that access to wells varies significantly across provinces. However, both access to water filters and wells need to be examined more in detail at district level in order to provide reliable recommendations for targeting. The open-source raw data file can be downloaded here: Sanitation Coverage Data. A summary and visualization of the data will soon be available on the Open Development Cambodia (ODC) webpage.